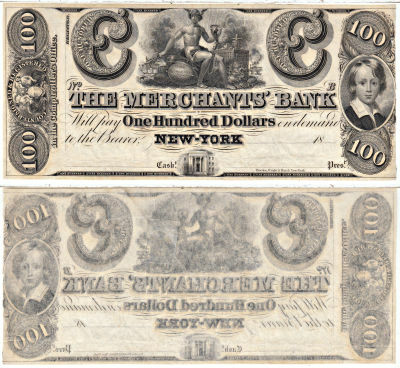 After the end of the American Revolutionary War, the U.S. government struck coinage, but did not issue any official paper currency for circulation. 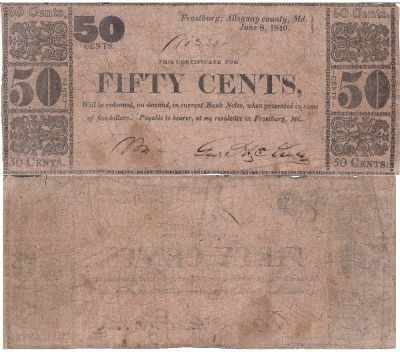 This made everyday commerce difficult, as large transactions would be very cumbersome if completed solely with coins. 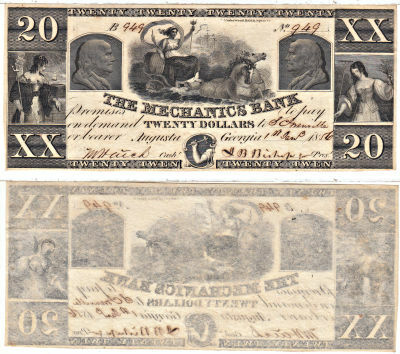 Accordingly, private banks and institutions began to issue banknotes to ease commerce. 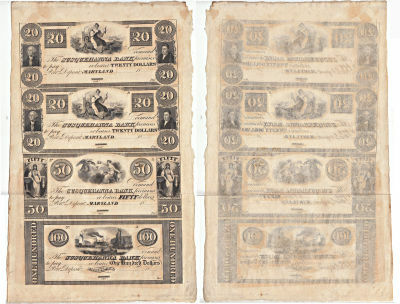 These notes are referred to as "Obsolete Currency" because they ceased circulating during the Civil War. 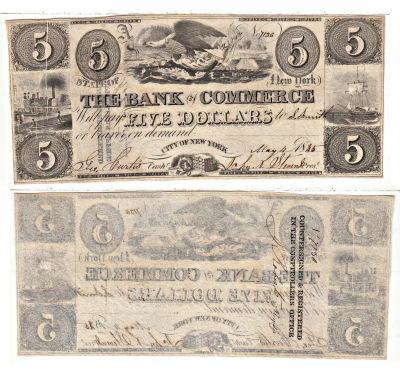 Between 1810 and 1865, countless banks, railroads, states, canal companies and private merchants issued currency in many different denominations. 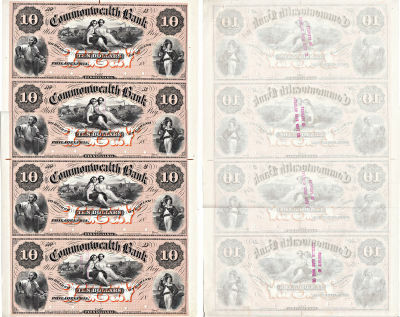 Some are very colorful and all are historic: odd denominations include 2 cent, $1.50, $3, $4, etc. 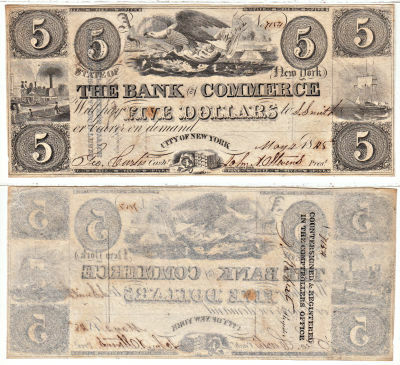 During the Civil War, the various Confederate States issued their own banknotes to circulate alongside Confederate currency. 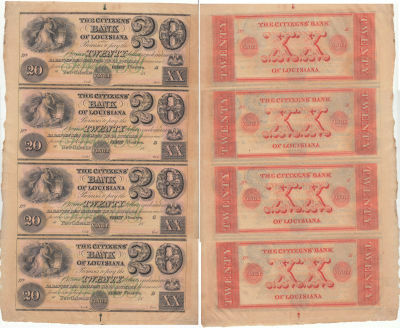 Obsolete currency is some of the most attractive and historically interesting currency produced in this nation. Add some to your collection! 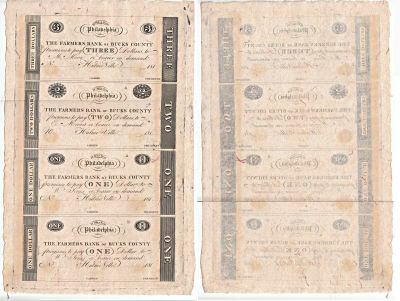 The Farmers Bank Of Bucks County Hulme Ville, Pennsylvania 4 note uncut sheet. Crisp paper white bright silk fibers. 1810's. $50, $100,$Blank. CCU. PA. 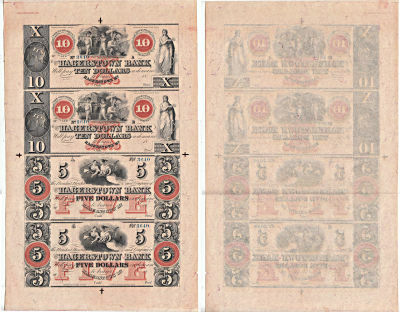 The Farmers Bank Of Bucks County Hulme Ville, Pennsylvania 3 note uncut sheet. Crisp paper white bright silk fibers. 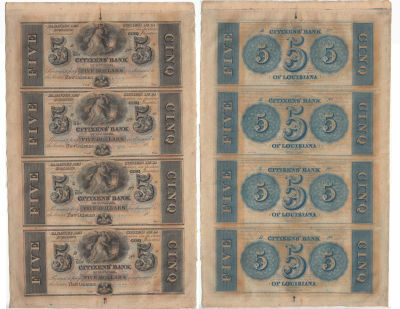 Susquehanna Bank, Port Deposit, Maryland 4 note uncut sheet. Nice crisp onion skin paper with multiple vignettes. Frostburg, Allegany County. Store scrip note of George Krebs. Very scarce! Merchants Bank, New York. Mercury seated on cotton; young boy. Light cut cancel partially closed with stamp hinge paper. Super $100! 1841. 50c, 6 1/4c, 5c, 25c 12 1/2c, 10c. CU. MD. Bank of Commerce, City of New York., Eagle with Shield in Shell on water., Scarce. 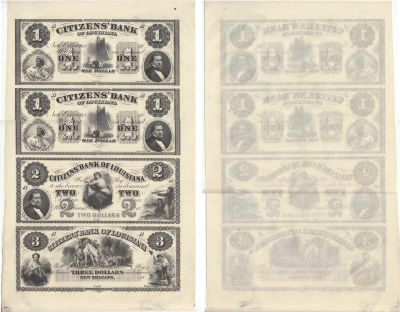 Uncut sheet of 4., Citizens Bank of Louisiana, New Orleans. A very popular issue. The $1's display a portrait of President Millard Fillmore, the $2 has a Vignette of a Maid at the Docks and the $3 a Deer hunter with dogs and catch. Bold color and great paper quality on this scarce Commonwealth Bank Philadelphia, American Bank Note Company proof. 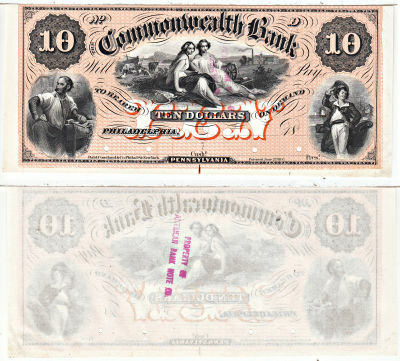 Bold color and great paper quality on this scarce 4 note uncut sheet, Commonwealth Bank Philadelphia, American Bank Note Company Proofs. 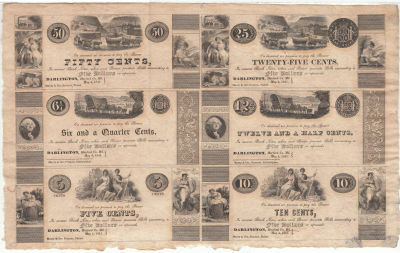 A crisp scarce uncut sheet of 4 notes. Well centered with bright overprint. 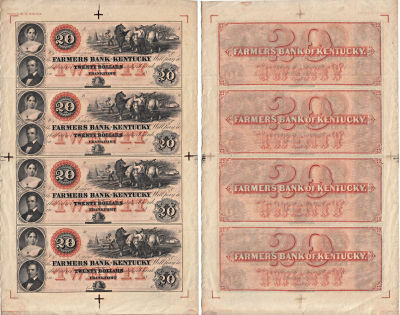 Farmers Bank Of Kentucky, Frankfort 4 note uncut sheet of $20 notes. 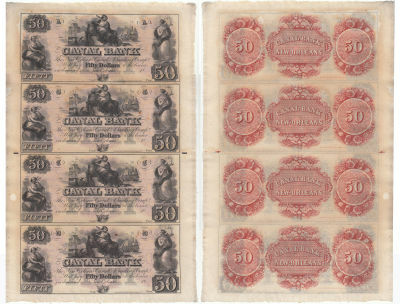 Crisp paper and great color, 3 horizontal folds. 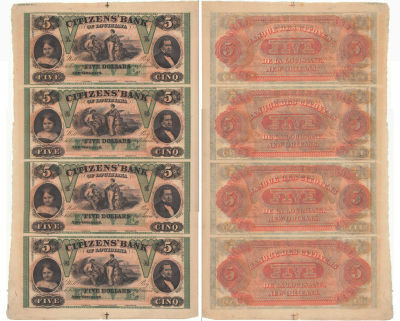 Uncut Sheet of 4., Citizens Bank of Louisiana, New Orleans. Gorgeous green and black colors on front and red reverse. Portrait of President Millard Fillmore. Citizens Bank of Louisiana, New Orleans., Vignette of Liberty with shield and coins. French text, blue back. Uncut sheet of 4. Mechanics Bank. Augusta. Horses pull maid in chariot. Benjamin Franklin. 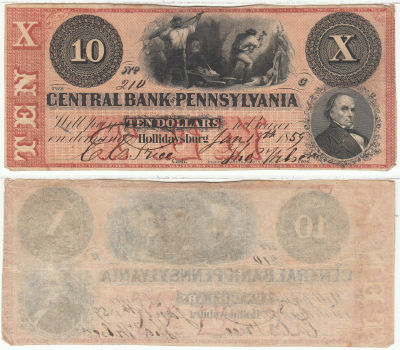 Central Bank, Hollidaysburg. Mining scene ctr; Daniel Webster r. Red tints. Super!